While you do that you cannot ignore the individual preferences of each of the loved ones in the family. And if there is a photographer in the family, then it would be unthinkable to gift anything which does not take pictures or at least help in the process of making one. Now let me be very honest with you. Photography is way more complicated than you think it is. I know you might be frowning at this point, may be even doubting my knowledge or even my capacity to say something like that. I know these days with smartphones in every hands photography couldn’t be simpler than it ever was. But trust me when I say this that there is more to photography than just aiming and pressing the shutter icon on your smartphone screen. Go and sit with the photographer in your family and ask him / her how difficult it is to make a great image, and you would probably have to sit through an hour-long lecture on the intricacies of good image making. But anyways, that is beyond the purview of this discussion. We are here for some gifting ideas meant for that budding photographer in the family. Now, I made this list after going through a list of the most gifted cameras on Amazon. Please note, these cameras include DSLRs only. But not all of them would be ideal gifts for all levels of photographers. I will sort them out in terms of their intended users to make things simpler. This camera is intended for beginner Photographers, someone who may have a point & shoot camera or shoots mainly with a smartphone and is looking to upgrade to a DSLR. The Nikon D5300 is an entry-level DSLR from the brand (and one of the best Nikon DSLRs under $1,000). The best thing about this gift is that it is complete. You have both the camera and the lens to get started straight out of the box. The D5300 is a 24.2-megapixel APS-C camera. APS-C means this has a cropped sensor. Cropped sensors are smaller than the 35mm film that you used with your point & shoot Kodak cameras. But are significantly larger than the sensor inside a smartphone. A large sensor is great for a number of reasons. It captures more light and therefore is better for low light photography. It also means better handling of noise, which is something that you normally get when shooting in low light conditions. Image quality is great. The 24.2-megapixel sensor has no optical low pass filter. This is a filter that is placed in front of the sensor to prevent it from capturing moiré and false colors that normally plagues high-resolution sensors. So, you can expect really sharp images with a lot of detail. The digital images are 6000 x 4000 pixels in dimension and can be easily printed in 8 x 11″ size. The other features of the camera include a 39 point AF system, 5 frame continuous shooting speed, 3.2″ LCD screen with a resolution of 1.037 M dots, and a full HD video shooting capability. A camera is never complete without a lens. That is why this package comes complete with an 18-55mm kit lens. The 18-55mm f/3.5 – 5.6 ED VR is a G lens. G lenses are specifically designed for the smaller APS-C cameras like the D5300 which do not have a built-in auto-focusing motor. That means this lens (with a built-in auto-focusing motor on the lens body) will have no problems auto-focusing on the D5300. The lens comes with image stabilization built-in it for blur-free hand-held shooting. The 18-55mm focal length range gives it the status of a standard zoom. Standard zooms are perfect for everyday photography, landscapes, architecture, seascapes and events. They are perfect for most types of photography that a beginner photographer would want to shoot, except for macro and wildlife. The EOS Rebel T7i is a very powerful entry (or as this segment is sometimes referred to as upper-entry) level camera. This camera too is ideal for entry level photographers as well as for users who are migrating from a point & shoot or a smartphone (and for bloggers). The rebel T7i is also known as the EOS 800D. This camera has a similar resolution (24.2 megapixel) APS-C sensor as the Nikon D5300 that we just finished reading about above. However, Canon APS-C camera sensors are slightly smaller in comparison to Nikon sensors. The Rebel T7i is a feature packed camera and, just like the D5300 above comes complete with a paired kit lens, the 18-135mm IS STM. The high resolution sensor promised highly detailed images which you can print big. The one thing that separates the two sensors is the optical low pass filter. The Rebel T7i does have one which reduces the optical sharpness of its images slightly. Having said that, the big feature on this camera is the dual-pixel CMOS auto-focusing technology. This feature is for shooters who love making videos with their DSLRs and well as for those prefer shooting with the live-view feature of the camera. Generally, when shooting with the live-view feature of a DSLR camera auto-focusing becomes an issue. Traditionally, live-view shooting uses what is known as contrast detection auto-focusing. The dual-pixel CMOS auto-focusing technology was developed to overcome this problem. The other features of the Rebel T7i include a 45 point all cross-type auto-focusing system, a 6 fps continuous shooting speed, full HD video recording and built-in Wi-Fi and Bluetooth. The Rebel T7i is paired with an 18-135mm f/3.5 – 5.6 IS STM lens. This is a special lens. It is powered by the STM auto-focusing motor. This is a smoother focusing motor that is geared to match the dual pixel CMOS auto-focusing technology of the Rebel T7i. The lens does have optical image stabilization built into it. That ensures stabilized hand-held shooting. If you have a budding photographer in the family, someone who might already be toiling hard and saving up to buy a pro body, this camera will make his/her day and his/her year! Provided of course that he is a Nikonian. The Nikon D750 is a full-frame pro DSLR designed for the budding professional. This is not the best pro DSLR out there, but its features are good enough for a budding professional to feel good about his gear and the potential that it offers. What makes this a great camera? Nikon has put in a lot of care and thought into this camera. The auto-focusing mechanism is powered by a multi-cam 3500FX II 51-point system, 15 of which are cross-type. The metering system is powered by a 91k-pixel RGB sensor. It also has a Group Area AF mechanism that comes in handy when shooting low contrast subjects or subjects that cannot be locked on properly with a single AF point. Please note that this item does not have a lens bundled with it. You will need to buy a lens separately. But the best thing about this camera is the large sensor. The sensor resolution is only 24.3 megapixel. So, it may appear that this camera and the one that we are about to read have less resolution than other camera systems. But bear in mind that this is a large sensor. The same size as a 35mm film frame. That makes the individual pixels of the sensor much larger. In photographic parlance larger the size of the individual pixels, the more is the light capturing capability of the sensor. That is handy when shooting low light images. The other features of the camera include a 6.5 fps continuous shooting speed, 3.2″ 1229k-dot LCD monitor, built-in Wi-Fi and a full HD video recording capability. There are a host of video recording features as well. If the person intended is interested in video work the D750 will be a great addition to his / her gear. Meant for advanced users, or someone who already owns a similar brand APS-C camera. 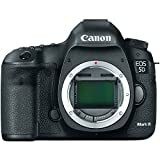 Canon recently came up with the EOS 5D Mark IV, the latest in the 5D series. This is a great camera for both stills and video work. This is another full-frame DSLR camera. The resolution of the sensor is 22.3 megapixels. I have already explained about the ‘low’ resolution as well as large sensor sizes and how this is not a disadvantage. The sensor is assisted by a Canon’s DIGIC 5+ image processing engine and 61-point high density reticular autofocusing technology. 41 of these points are cross-type and 5 of these are dual cross-type. Metering on the camera is powered by a 63-zone dual layer iFCL metering system for accurate metering. This powerful camera is loaded with great shooting features. These include full HD video recording, 6 fps recording, 14 bit A/D conversion, and a high dynamic range. Video shooting capabilities have been improved compared to the 5D Mark II which was rated one of the best in the business when it was released. Other features include a 3.2″ Clear View II LCD screen. This is a well-built rugged design that is crafted out of magnesium alloy and having good weather resistant. However the camera is not completely weather resistant. This camera, again is suggested without a lens. You will have to invest in a lens separately. Otherwise it is suggested that the person intended for this camera is a Canon user and has existing lenses to go with the camera. Yet another APS-C camera and again from the house of Canon. The EOS 70D is one of those DSLRs that had revolutionized movie making with the introduction of the dual-pixel CMOS auto-focusing technology. I have intentionally picked a majority of the cameras from the APS-C segment as this is much cheaper than the full-frame options. Plus, if you are going to gift to a budding photographer, a mid-range or even budget DSLR will be good enough. The EOS 70D is a formidable camera. It is great for shooting videos and great for shooting stills as well. It is powered by a 20.2 megapixel sensor capable of producing images as large as 5472 x 3648 pixels. It is good enough for a large print. The images capture a lot of detail. A DIGIC 5+ image processor powers image processing on this camera. A 19 point all cross-type phase detection AF system powers the camera. Metering on the system is powered by 63-zone dual layer metering sensor. The EOS 70’s other features include a 7 fps continuous shooting speed, a 3″ 1.04 m dots resolution rear LCD vari-angle touchscreen and built-in Wi-Fi connectivity. Finally, the movie mode on the camera is a worthy mention. These days no digital camera is complete without movie capability and this is where the EOS 70D is a good option for someone contemplating a career in movie making. Even if you are just looking to capture moments on your vacation or a family get-togethers the EOS 70D does a commendable job. It shoots full HD at 30p and takes advantage of the Movie Servo AF feature of the camera together with the dual pixel CMOS AF technology. Please note, Canon has recently discontinued this model. A newer model the EOS 80D is now available. But instead of being a disadvantage that is an advantage for you. This camera is available at around $450 cheaper than the new one. And despite the technology leap, the EOS 70D remains a formidable camera. Related Post: Canon 80D vs 70D – What’s the Difference?